My second experiment with Digital Art. The story of the Fall of Man is well-known in the Christian world and beyond. Based on Chapter 3 of the book of Genesis, the Fall is the story of Adam and Eve, who lived in perfect innocence in the Garden of Eden with God until they were tempted by a serpent to eat from the tree of knowledge of good and evil, which God had forbidden. Their eating from the tree marked the end of their innocence and their expulsion from the Garden of Eden. 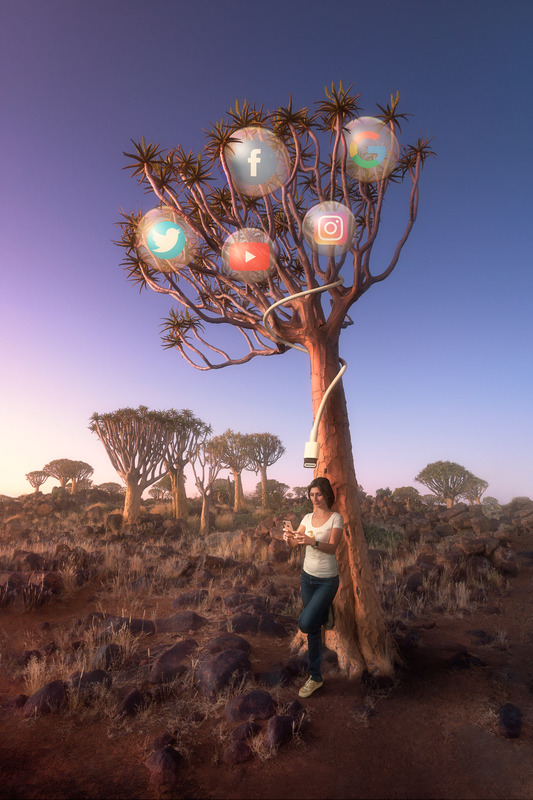 Composite image, background shot in Namibia – focal length 21 mm, aperture f/8, shutter speed 30 seconds, ISO 320, tripod, foreground – Eve, Serpent and Fruits – shot in my Home studio. I wanted to rethink this story in modern terms. There are scholars who see the story of the Fall not only as ancient act of hubris and disobedience, but as a choice repeated by each soul born into the world. I wanted to imagine the Fall as a story for the twenty-first century. We inhabitants of the modern world have our own tree of knowledge, in a sense; we have the global internet, which is capable of improving our lives immeasurably as well of immense harm. Progress always comes at a cost, and while the internet has advanced life in innumerable ways, it has also damaged us in perhaps equal measure. For my reimagined Fall, I pictured the internet as the tree of knowledge, and its tempting — but potentially harmful — fruits are the applications that increasingly influence our lives — Google, Facebook, Twitter, Instagram, and YouTube. I fashioned a lightning cable as a latter-day serpent slithering toward its guileless prey. This was a bit of an experiment for me, as I am practicing some new digital art techniques. It’s an interesting process and I hope you like the result, as well as my critique of modern technology.